A GRIEVING orca, whose calf died shortly after being born, has hit social media right in the feels and is shedding light on a serious problem. 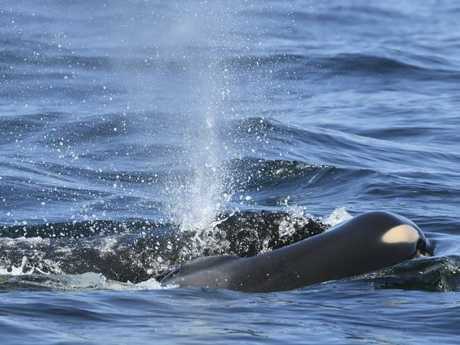 The mother was spotted by scientists who closely track the endangered orca population propping the lifeless newborn on her forehead and trying to keep it near the surface of the water off the coast of British Columbia in the Pacific Northwest. "The baby was so newborn it didn't have blubber. It kept sinking, and the mother would raise it to the surface," Ken Balcomb, senior scientist with the Center for Whale Research on San Juan Island, who has been tracking the population for more than 40 years, said. The calf died on Tuesday morning about half-an-hour after it was born but its mourning mother, known to researchers as J35, has been seen swimming with it, pushing it to the surface of the water, for days. She was last spotted on Sunday morning still carrying her dead calf, according to the Seattle Times. Orcas, or killer whales, are known to be highly social - using sophisticated hunting techniques and vocal communication, which are often specific to a particular group and passed across generations. Because of this, they are known to exhibit emotions like grief, so mothers often do carry the bodies of their deceased young on the water's surface. However, Mr Balcomb told the New York Times that he has never witnessed it go on for this long. "I think she's just grieving, unwilling at this point to let the calf go, like, 'Why, why, why?'" Mr Balcomb told the Times. "We know it happens, but this one is kind of on tour almost, like she's just not letting go." 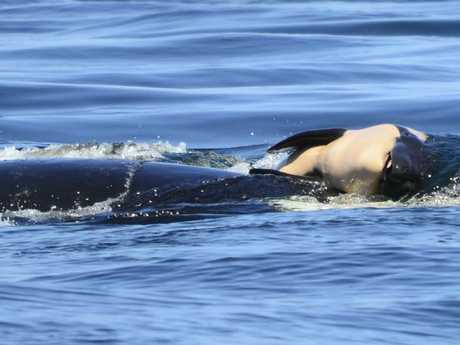 A resident of San Juan Island said he spotted the rest of the grieving mother's pod engage in what appeared to be a mourning ritual for the calf. "At sunset, a group of 5-6 females gathered at the mouth of the cove in a close, tight-knit circle, staying at the surface in a harmonious circular motion for nearly two hours," the resident told the Centre for Whale Research. "As the light dimmed, I was able to watch them continue what seemed to be a ritual or ceremony. They stayed directly centred in the moonbeam, even as it moved. The lighting was too dim to see if the baby was still being kept afloat. It was both sad and special to witness this behaviour. My heart goes out to J35 and her beautiful baby; bless it's soul." The heartbreaking mourning ritual has captured the hearts of many on social media, as it has become a devastating symbol for the plight of the orca, whose population is already at its lowest in more than three decades. The calf that died was first calf born in three years to the endangered orcas that spend time in Pacific Northwest. The distinctive black-and-white, salmon-eating orcas have struggled since they were listed as an endangered species in the US and Canada over a decade ago. So incredibly painful to see. You can feel her grief and loss. I’m sorry sweet mother. They're not getting enough of the large, fatty Chinook salmon that make up their main diet. 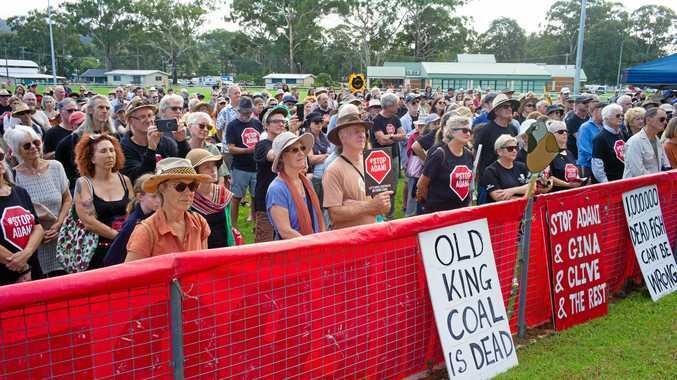 They also face overlapping threats from toxic pollution and noise and disturbances from boats. As a result, female orcas have been having pregnancy problems because of nutritional stress. A multi-year study last year by University of Washington and other researchers found that two-thirds of the orcas' pregnancies failed between 2007 and 2014. "On average we expect a few calves born each year. The fact that we haven't seen any in several years and then to have reproductive failure is further evidence that we have a severe problem with the reproductive viability in the population," said Brad Hanson, a wildlife biologist with the Northwest Fisheries Science Center in Seattle. Adding to concerns is the health of a 4-year-old female orca known as J-50. Mr Hanson said she looked thin and "clearly emaciated" when he and others observed her from a boat on Saturday near San Juan Island while collecting the whale's breath samples. The breath droplets will be analysed for possible pathogens to rule out some other disease resulting in them not wanting to eat, Mr Hanson said. 6 days of grieving 😢💔 she wont let go of her dead baby. UPDATE: orca whale J35 seen Sun morn still carrying her dead calf. Another researcher, Deborah Giles, said you could see the shape of the whale's skull through her blubber. "I've never seen an animal this emaciated make it. But I'm hopeful that she will bounce back," Ms Giles, who is a researcher for the UW Center for Conservation Biology, said. In some heartening news, however, the plight of the orca population has been slowly gaining some political attention. Washington Governor Jay Inslee signed an executive order in March directing state agencies to take immediate action to help the orcas. A statewide task force he formed has been meeting since May to come up with recommendations. A report is due later this year. "The death of the orca calf is a heartbreaking reminder of the urgency we face in saving these iconic animals," the governor's spokesman Jaime Smith wrote in an email to the Associated Press. Individual whales are identified by researchers by unique markings or variations in their fin shapes, and each whale is given a number and name. Their movements are closely tracked and photographed by researchers, whale watchers and fans.